Does this sound like a prayer that you might hear right now, today? Alarming reports of crime, violence and dishonesty are an everyday occurrence. Does it seem possible that these words were penned over two thousand years ago? The human condition after Adam and Eve’s decision to disobey God has always been tainted by sin. 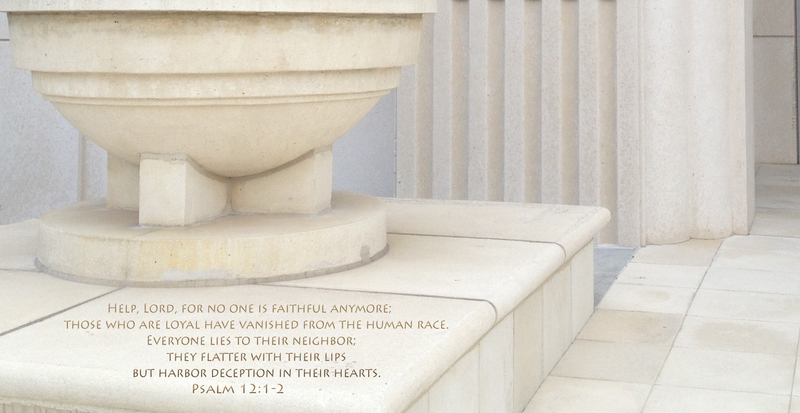 Yet, there are times and the there are the people of those times who have chosen to be faithful. They have chosen to be loyal. They have chosen a path of honesty. Their hearts have been a place of transparency and truth. Even though “things” may seem bad in the world, we can pray. We can be encouraged that God hears us and that there are still those alive today who are choosing to follow Him. The ocean’s vast waters glow with the brilliant light of the evening sun. Bursting from the horizon, it’s reflection marks a pathway across the waves in blazing intensity. I watched as a man traveled alone across the waves, heading for the light. 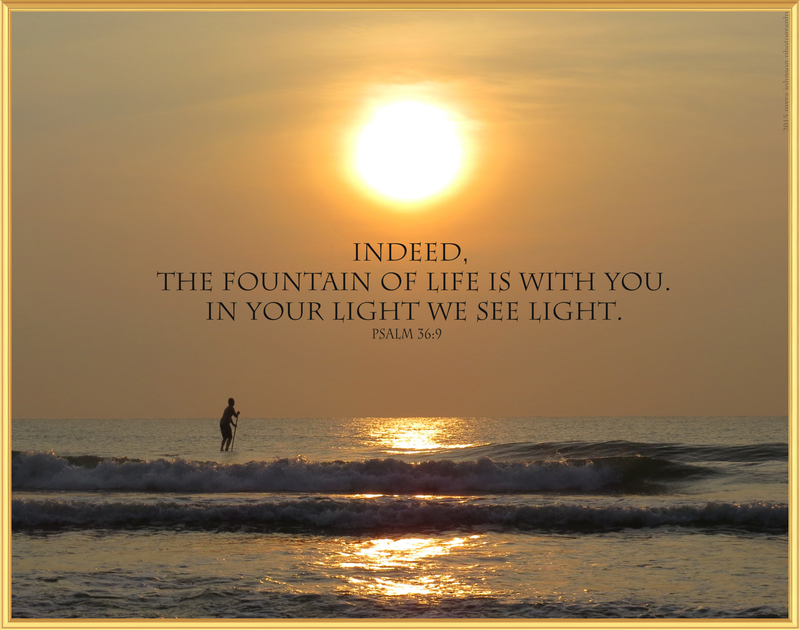 Am I heading for God’s light, where true life is found? The Bible contains the account of a man who once came to Jesus asking how to receive eternal life. Jesus spoke to him about keeping commandments. Further in the conversation, Jesus told the man to sell all his possessions and to come and follow Him. The man was saddened and went away. Is anything impossible if God wills that it be so? What in your own life seems impossible? Rich men can leave their riches and turn to God. Men and women can leave their old ways of living behind and begin living a new life with Jesus as their Lord. The journey we are on is rife with seeming impossibilities. God is with us, however, on every part of the path. It is He who renders the impossible possible. While I was driving home today, I was listening to music. Even though it’s not Christmas anymore, I still listen to Christmas music sometimes. “The Little Drummer Boy” came on. The story is of a little boy who was orphaned when robbers came and broke into his home at night, taking the lives of his parents. He alone escaped, along with some dear animals, one of which was a lamb. Shortly before the intruders’ attack, the boy had been given a drum by his parents for his birthday. He had that with him, as well. Wandering the dessert and finding himself angry and bitter about his parents’ fate, he began to feel hatred toward all people. 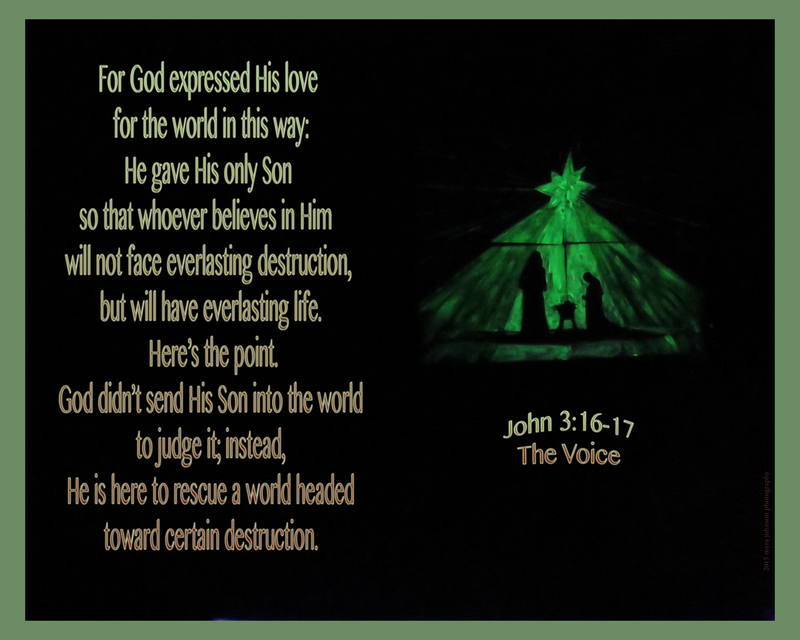 Toward the end of the story, he finds himself in Bethlehem, with crowds everywhere, due to the census that had been proclaimed. A speeding wagon accidentally hits his little lamb. He is heartbroken, once again. People are gathering around a certain place, looking at a mother and her newborn baby. Gifts are being brought to the child. The boy approaches, having nothing to give. Quietly, he takes out his drum and begins to play. His talent and his heart are all he has to give. As he plays, the baby Jesus smiles at him. Then, one of the three wise men who had also come bringing a gift, speaks to the boy. He tells him that Jesus must have liked the boy’s gift best of all. Hearing this, he sees that his little injured lamb is completely well. At this point, so is the boy’s heart. What gift does our King desire today? If your talents and your heart are all you have to give, isn’t that what will make Him smile? Does it matter to God what words we say? 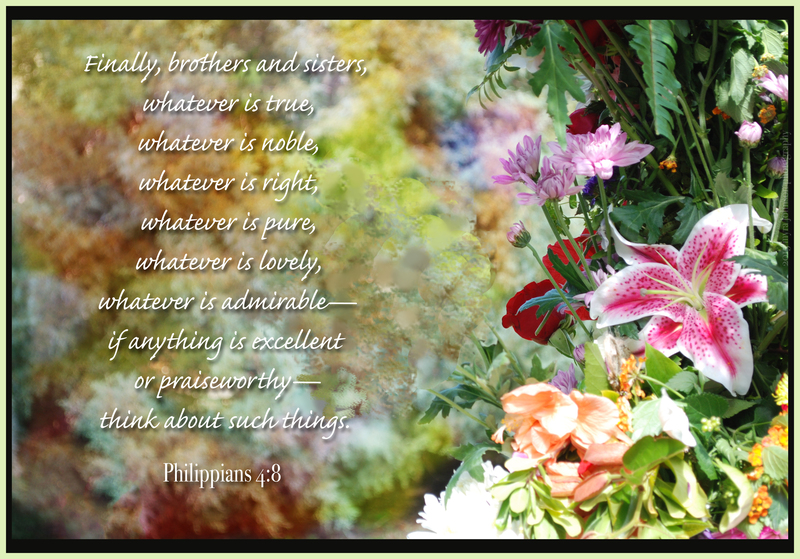 Does it matter to God what thoughts we think? Does it matter to God how we treat others? Does it matter to God how we treat ourselves? Does it matter to God what we allow ourselves to listen to? 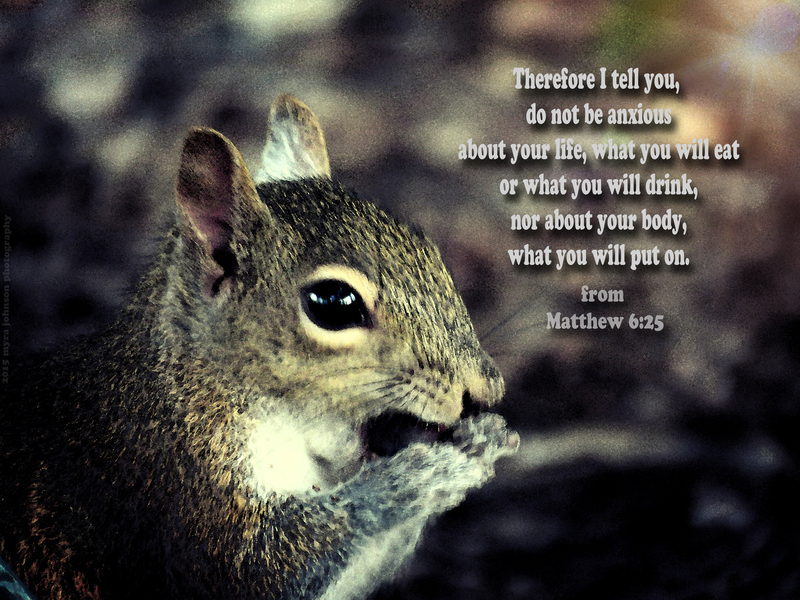 Does it matter to God what we choose to bring into our minds through our eyes? Does it matter to God if we are obedient to Him? Does it matter to God if we are respectful to other people? 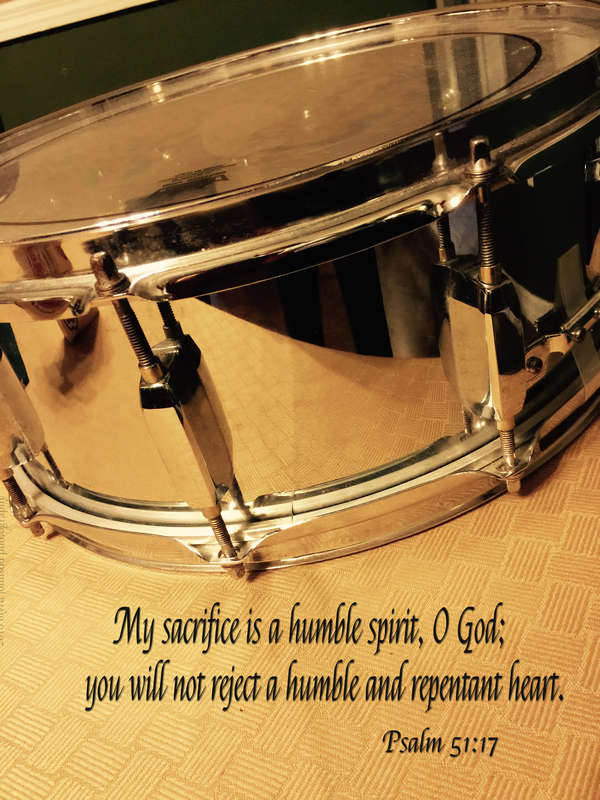 There is a certain scripture passage that is very sad to me. Coming to His hometown, He began teaching the people in their synagogue, and they were amazed. “Where did this man get this wisdom and these miraculous powers?” they asked. “Isn’t this the carpenter’s son? Isn’t His mother’s name Mary, and aren’t His brothers James, Joseph, Simon and Judas? Aren’t all His sisters with us? Where then did this man get all these things?” And they took offense at Him. 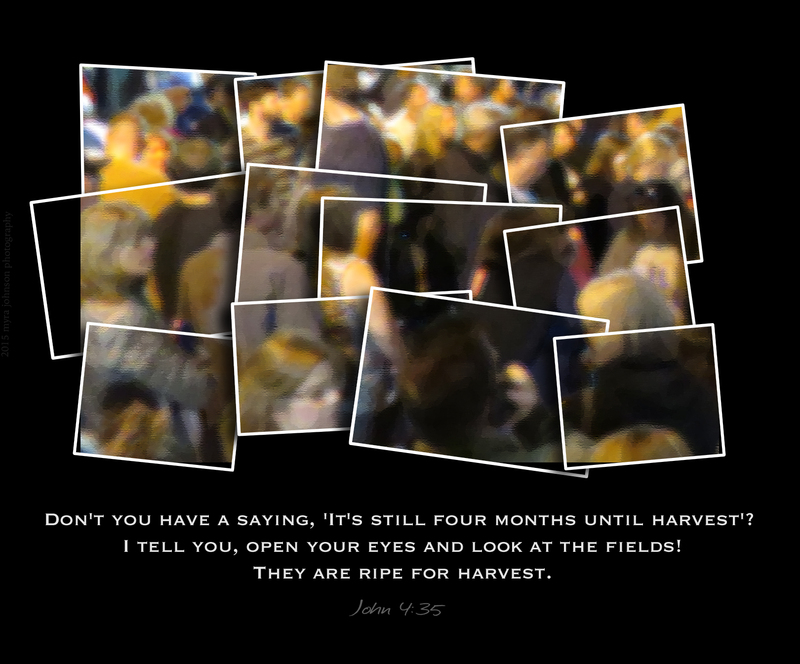 The people were “amazed,” yet many must not have believed. Think of all the accounts in the Bible of Jesus healing people. Jesus even brought people back from being dead. 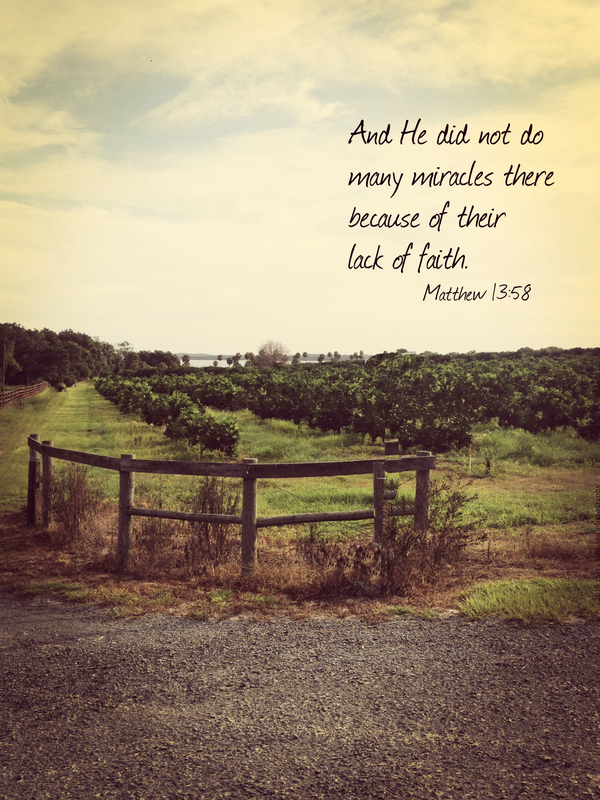 He would have, but instead of everyone running to Him, bringing their loved ones to be healed, they had a lack of faith. Is it any different today with some? Jesus is ready and willing to bring many facets of healing into every life that believes. Does everyone who hears about Him take advantage of that truth? Instead of running to Him, bringing their broken hearts and broken lives to be healed, they have a lack of faith. Jesus is ready and willing. The swallow-tailed kite soared above me. These birds travel from North America to South America for the winter and then back again. Free to go where they want to go and where they need to go. God has given them this freedom and the desire to make the journey each year. With Jesus, we can have freedom, too. Freedom to live the life that God wants for us. A life no longer in slavery to sin. Jesus answered them, “I can guarantee this truth: Whoever lives a sinful life is a slave to sin. A slave doesn’t live in the home forever, but a son does. 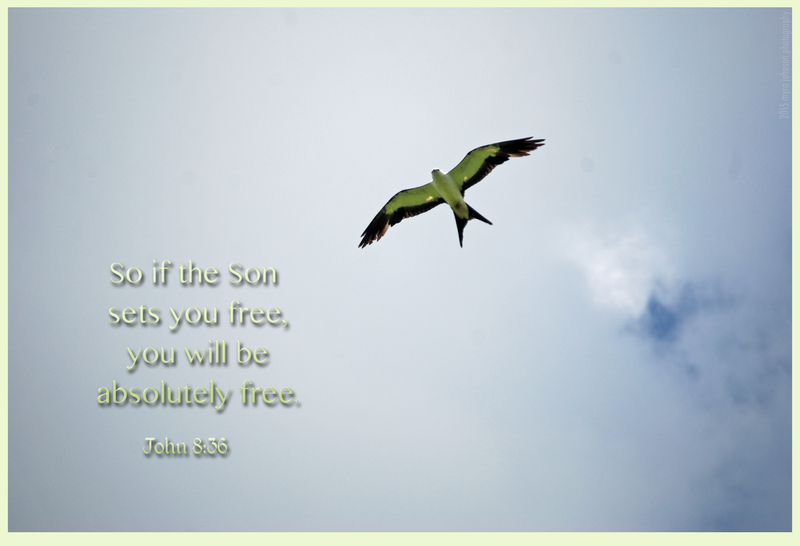 So if the Son sets you free, you will be absolutely free. The tiny white flowers were beautiful, but too numerous to count. Even though there were a great many blossoms, I would’ve had more sins than that even in a relatively short period of time. Neglecting what God wants me to do? Knowing that God has forgiven us should soften our hearts to forgive others. We want to be forgiven by our heavenly Father. Isn’t that what others want from us? As I walked up to the old house, I knew immediately that I wanted to photograph it. Constructed of wood, the porch was suspended by some large stones on the corner. The weathered roof was a wavy metal and the windows were plain, yet serviceable. If we consider our bodies to be like a house that is getting older, we might wish that we could get a new one, except we are accustomed to who we are right now. God knows we are fragile and wearing. 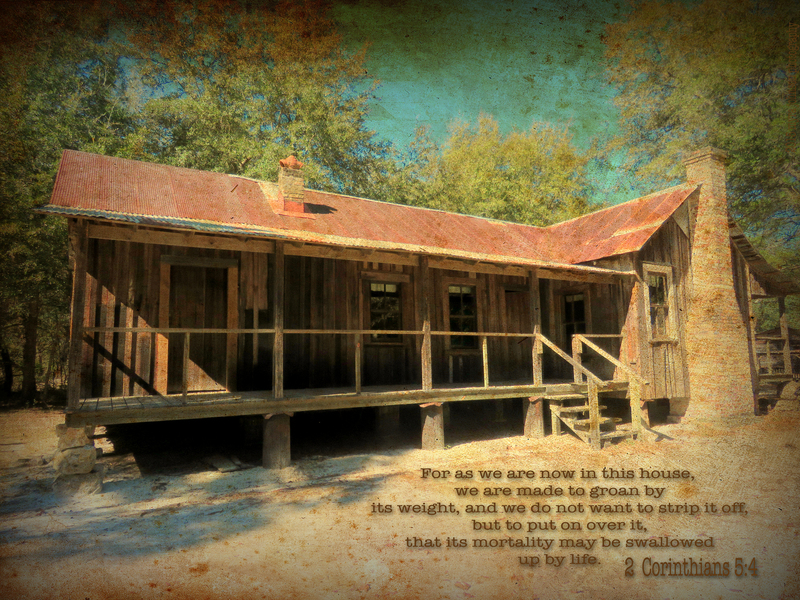 One day, those who know Jesus as their Savior will have a new house–a new body–that will not grow old or ill.
For as we are now in this house, we are made to groan by its weight, and we do not want to strip it off, but to put on over it, that its mortality may be swallowed up by life. 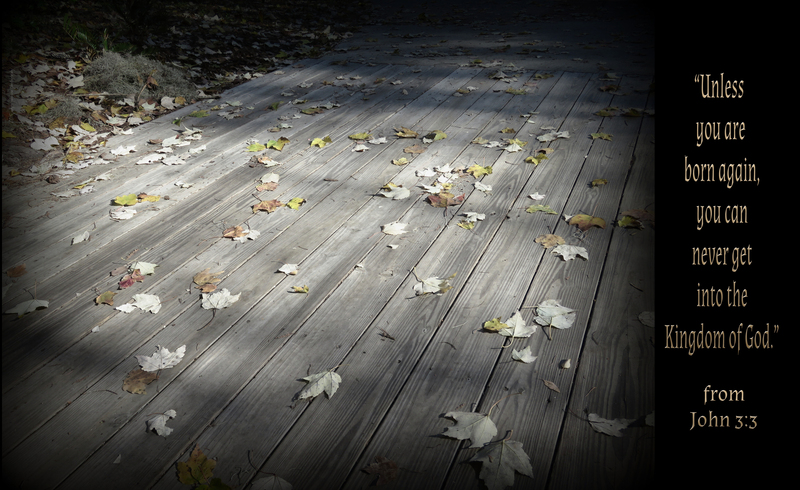 The leaves have fallen to the wooden deck below. The old leaves will be soon replaced with the new. The old must be replaced with the new in our lives, as well. The Holy Spirit gives us a new life—a new birth. Without it, we will never get into the Kingdom of God. Jesus replied, “What I am telling you so earnestly is this: Unless one is born of water and the Spirit, he cannot enter the Kingdom of God. Men can only reproduce human life, but the Holy Spirit gives new life from heaven; so don’t be surprised at my statement that you must be born again! I think each creation pleased Him. I think that pleased God, too. You crown the year with Your bounty…. What will we see in the coming days and weeks? I have faith that we will see the bounty of God. Everywhere we look, even in difficult situations, there are blessings from God. Things that are bestowed willingly to us. Things from the loving heart of God. What do you think you will see in the coming days and weeks? Lately, the words, “And when I cannot stand I’ll fall on You” have gone to a special place in my heart. How precious to even consider that during our greatest weakness, God is there for us to fall on. In recent weeks, several people that I know have faced extreme circumstances. In fact, some of them are still facing these trials today. My heart is solemn as I yearn for healing of every situation in the lives of my each of my friends who are facing troubles. God is the only One who can take care of each of the needs. What a precious privilege to have the gift of prayer. Jesus is able to to give me peace, even when those I love are ill.
My cousin is in ICU tonight. 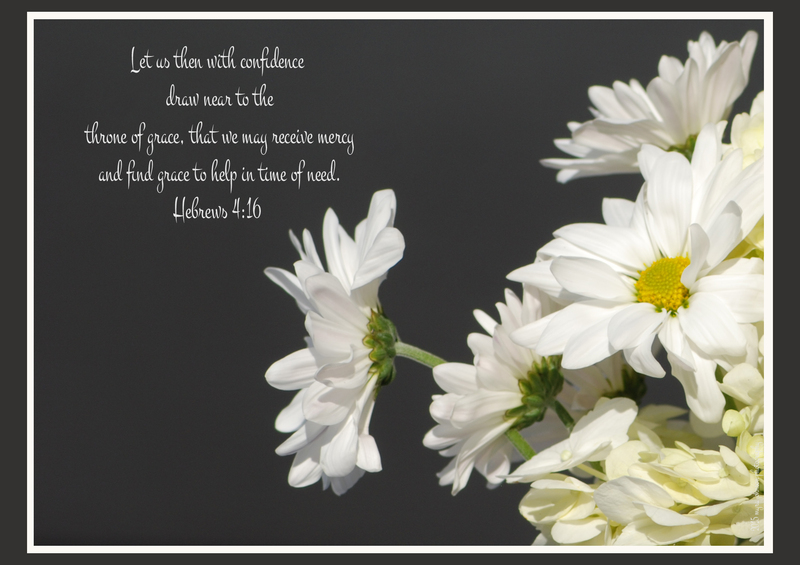 Jesus is able to give me peace, even as I realize that I am not in control of others’ lives. Those I love must make decisions for themselves. Jesus is able to give me peace, even when I realize that I cannot know the future. God alone knows the future and the past in its entirety. In the passage above, Jesus told His disciples not to have troubled hearts or to let their hearts be afraid. Instead, He wanted them to have peace. I think this is what He wants now, for me and for you. 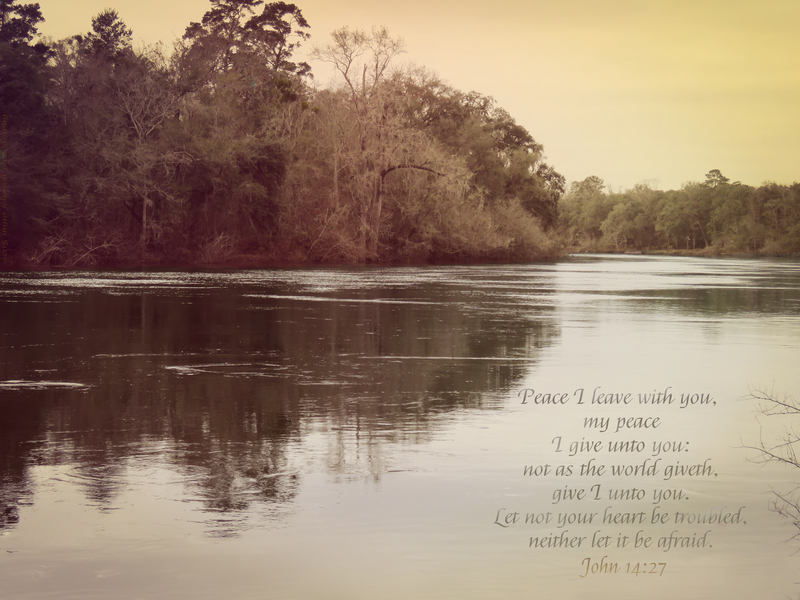 Does your heart need His peace tonight? Are you troubled and afraid? He was all alone on the boardwalk. Just a single black bird, visible through the opening in the deck rails. The lake below him, the blue sky above him, and a couple of trees growing nearby. 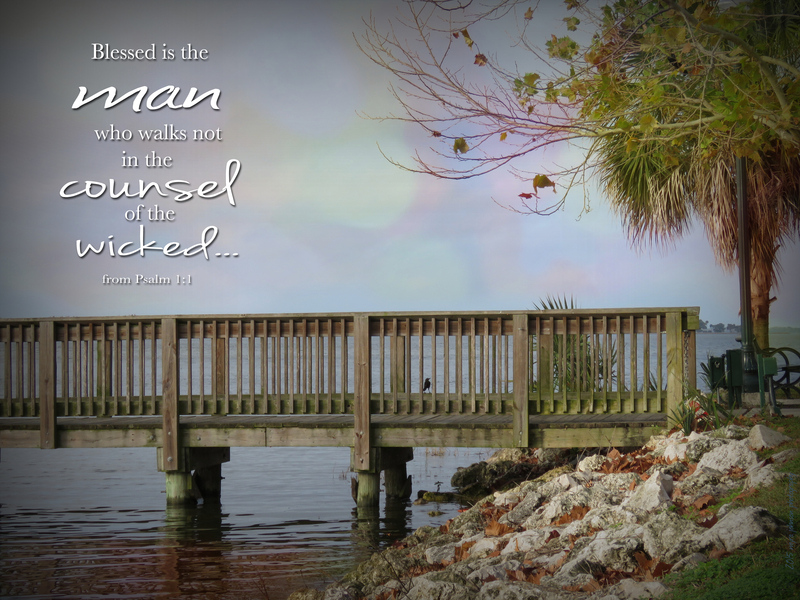 Sometimes, in order to keep from walking in the counsel of the wicked, we have to choose to walk alone. Sometimes, in order to keep from hanging around people who indulge in sinning, we have to choose to be alone. Sometimes, in order to keep from being with people who enjoy scoffing at others, we have to choose to be alone. Even if we are alone, we can be blessed by God. We can think about what God would want in our lives. 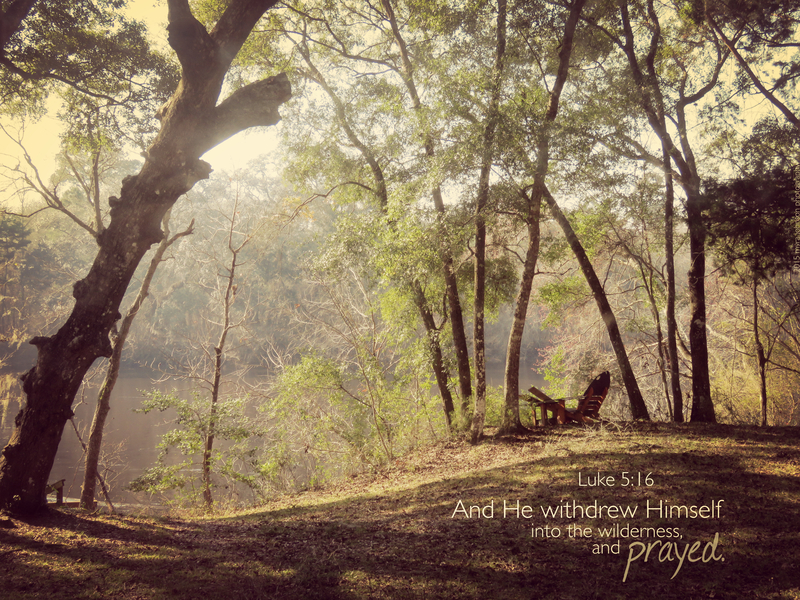 We can pray day and night and He will always hear us. Pleasing God is what’s important, even if it means we are far away from the crowd. As I was walking, I noticed the white feather on the ground. Looking at my photograph now, I see water droplets adorning it like spheres of ice on a snowy meadow. Perfect in form and perfect for the animals who possess them. I don’t remember ever having thought of this before, but tonight, “Surely He will save you from the fowler’s snare” stood out to to me. A fowler is someone who hunts for wild birds. A snare is something they would use in order to catch them. So, it is saying that God will save us from whatever the bird catcher is coming after us with. I understand that this is metaphorical, but I don’t remember ever thinking about myself as a bird that was being hunted and that God, who is being pictured as having feathers and wings like a bird, is protecting me. 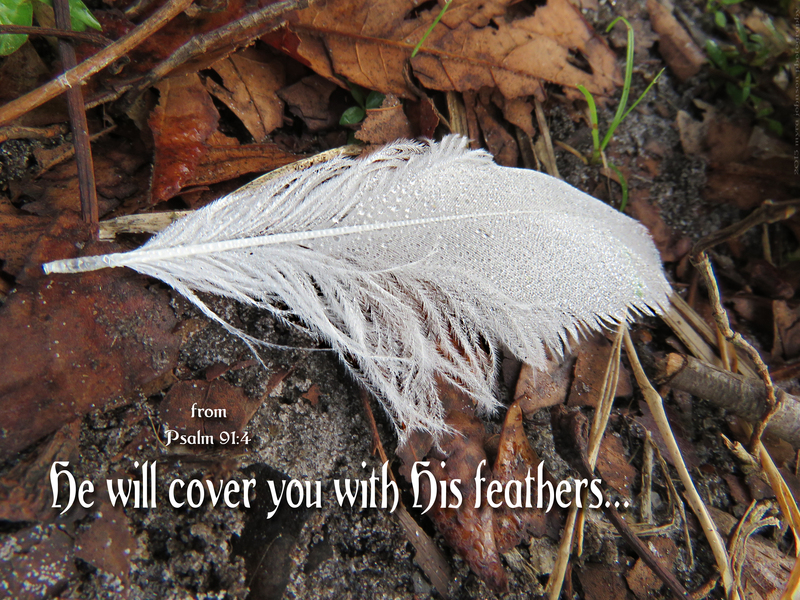 The divinely strong feathers and wings of my heavenly Father will protect my weak and spindly feathers and wings as I take refuge in Him. The traffic was called to stop as the guard arms came down into place by the railroad. In the near distance, I could hear the sound of a train whistle. Seconds later, a train came, crossing in front of me. I will never know, but the conductor of the train knew just exactly where it was going. He also knew that the train would get there on the rails. Not on the paved highway where I was. Not by traveling on vast fields. It would get there on a train track that had been laid out to take them there. That was really the only way possible. If we want to live forever in Heaven, there is just one way. Not on the paved highway of good works. Not by traveling on vast fields of humanism. Not on dirt roads of self-sufficiency. We will have to go on a path that has been laid out to take us there. 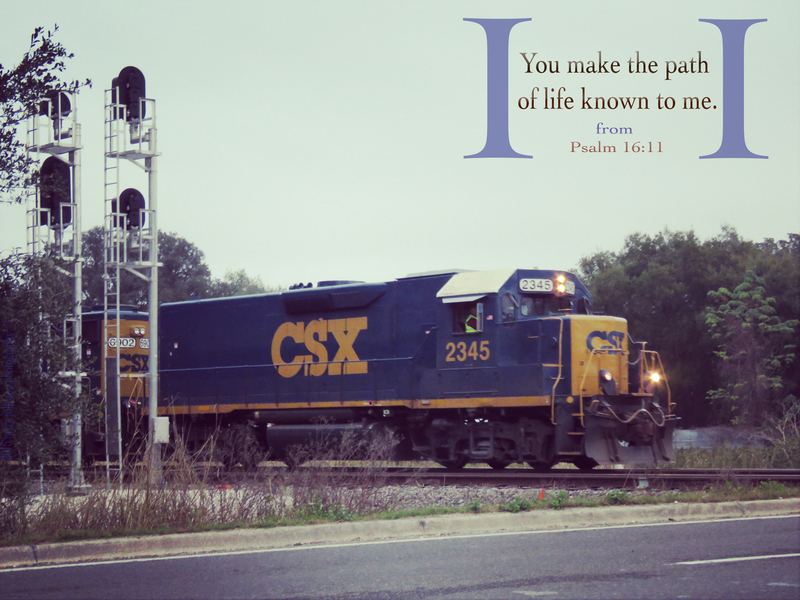 This path can only be traveled by those whose passage has been secured by faith in Jesus. 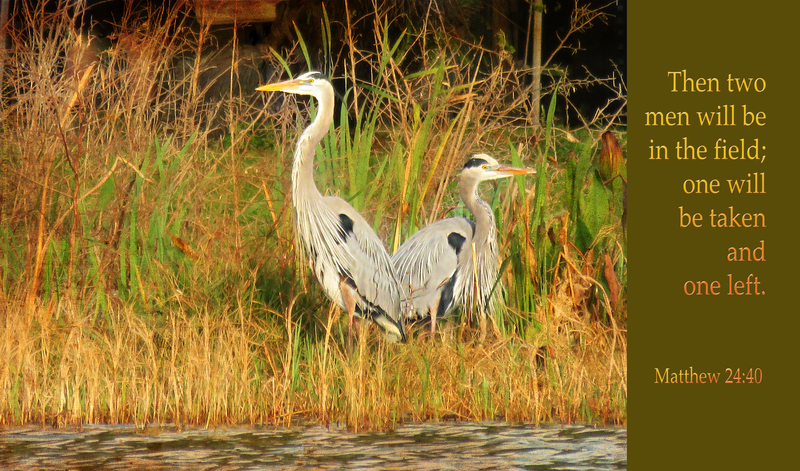 From across the lake, I could see two birds who were almost identical. The bird on the left wanted to look one way, while the bird on the right wanted to look another. What each one could see directly ahead of them was totally different, yet they actually stood so close together that their feathers looked like they were touching. We can be so much like another person—a friend, a spouse, a parent—but there can be one huge difference of the utmost importance. No matter how alike you may be to someone else, if one of you is not a believer in Jesus Christ, no other characteristics are significant. You both may be very generous people. You both may be kind. You both may have lived honest, upstanding lives, caring for your families and being good citizens. But if Jesus should return during your lifetime, one of you will be left, if you do not know Him. People we love and care about pass from this life. We cannot keep it from happening. Because Jesus died on the cross to pay the penalty for our sins, we do not have to enter eternity without hope. 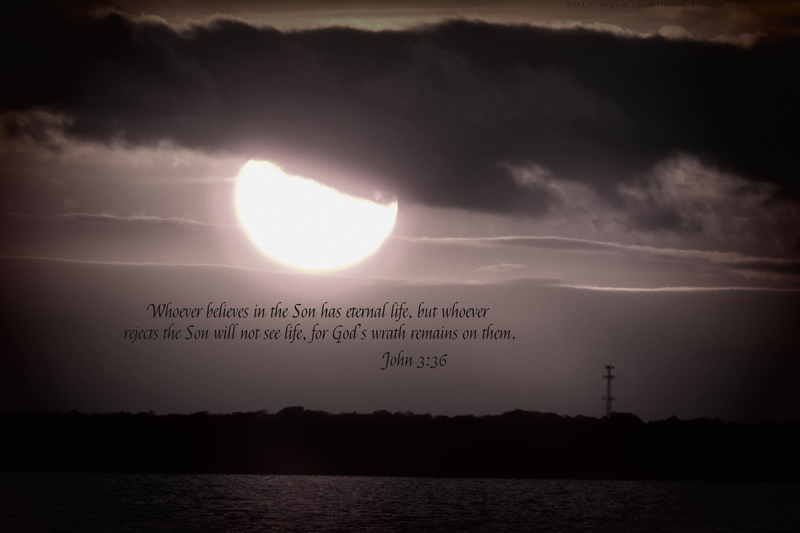 If we accept His gift of eternal life and believe in Him, we are promised life after death. What if I were to take this passage and replace “wise man” and “righteous man” with my name? Being personalized in that way, how would that speak to you if you inserted your name? If instruction is given to me, will I be still wiser? If I am taught, will I increase in learning? It may seem to be a given, yet there are those who pay no attention to instruction. There are those who are in the presence of teaching, yet they learn nothing. I don’t want that to be the case with me. Knowing God is the most important thing. At the end of life, is there anyone who could be called wise if they had never acknowledged God? 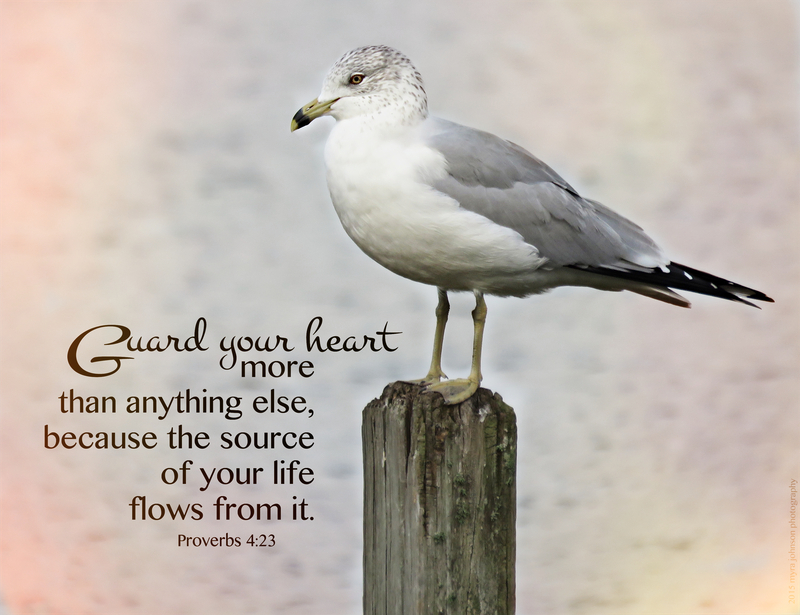 Why should we guard our hearts? Proverbs 4:23 tells us why. 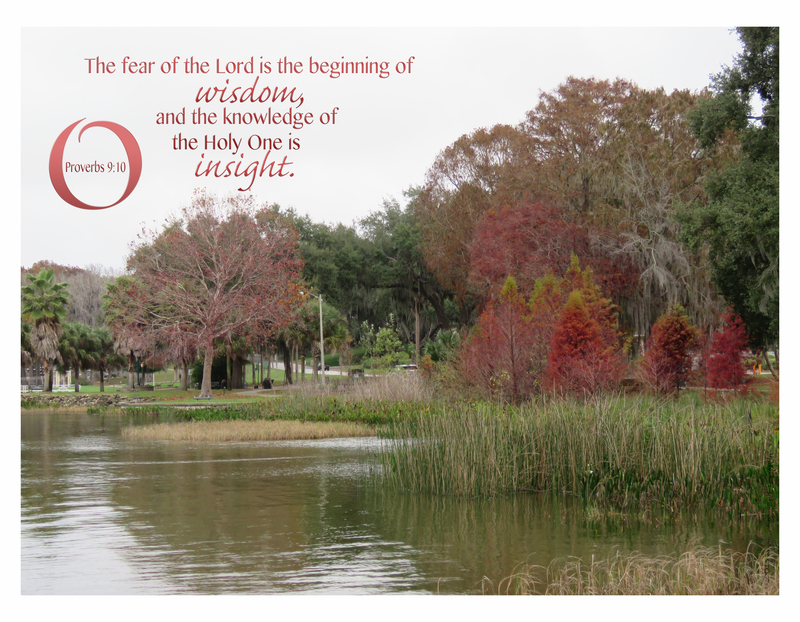 There are several translations of this verse, each giving us insight into the wisdom of this statement. Above everything else guard your heart, because from it flow the springs of life. Guard your heart with all vigilance, for from it are the sources of life. Keep your heart with all caution because from it is the outgoing of life. If our hearts need guarding, it must be that there is something to protect them from. If anything can draw our hearts and minds away from God in any measure, we must put up our guard against it. As the chapter unfolds, we find separate blessings. I don’t hear much about people blessing others anymore. 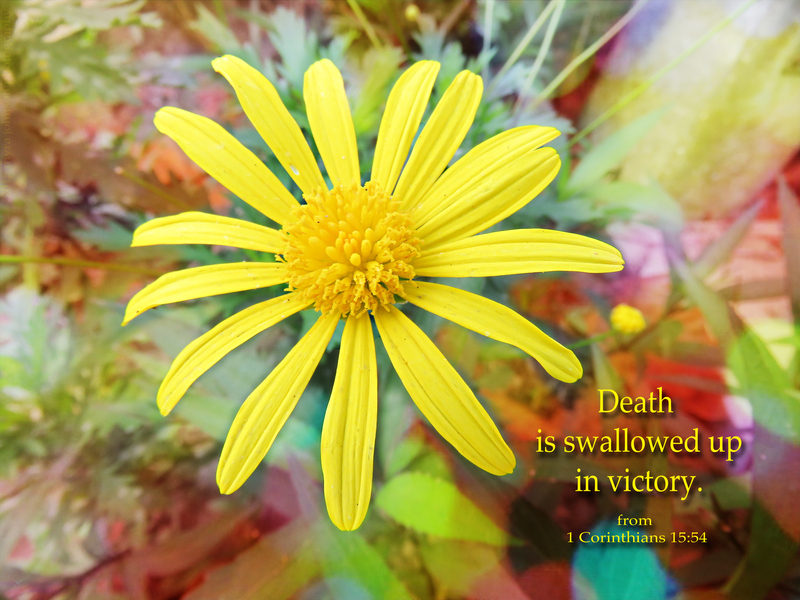 Not just when we are dying, but throughout our lives? What about praying for good things for our children, even when they become teenagers and adults? 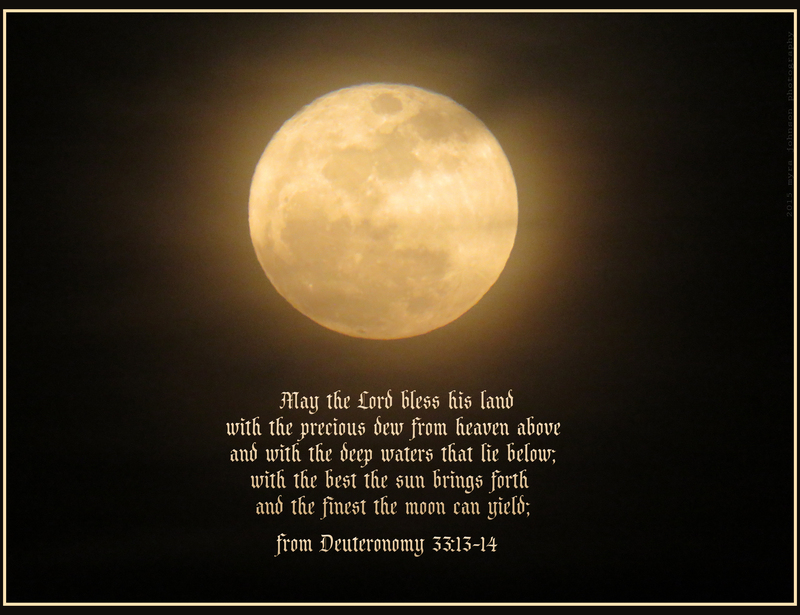 Prayers that ask the Lord to bless them. Prayers about blessing them with wisdom. Blessing them with hearts that are tender toward God. Can’t we bless our own children when we pray for them? Walking along the sidewalk of the park yesterday morning, I saw a squirrel not far from me. Securing an acorn in his paw, he began to eat without fear of my presence. The trees in my own yard yield a great many of those same acorns. On any given day, I can see squirrels scampering in my yard, enjoying life. God provides them with the food they need. He can provide for us, as well. The leaves are turning brown and falling off the trees. For most of the country that I live in, this happened a few months ago. 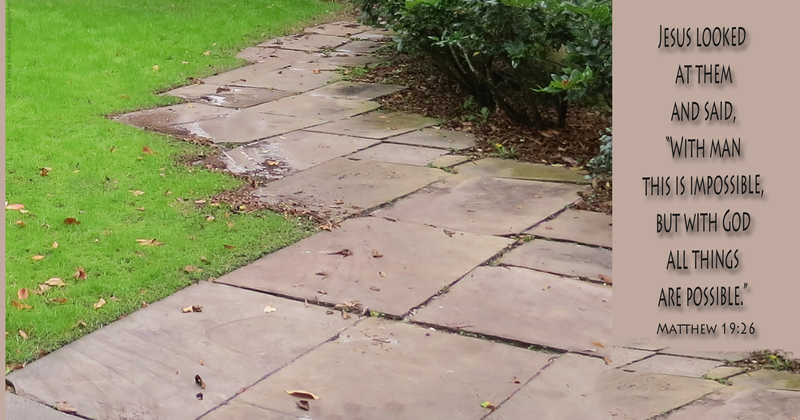 It appears that autumn has finally arrived, but what about winter? Even though the leaves are turning colors and falling to the ground, the ground is quite likely to be covered in green, as though it was spring or summer. Since I live in a subtropical climate zone, all is as it should be. The high temperature today was probably around 84 degrees. It’s the right time for all of that. There’s a right time for everything, even in our lives. 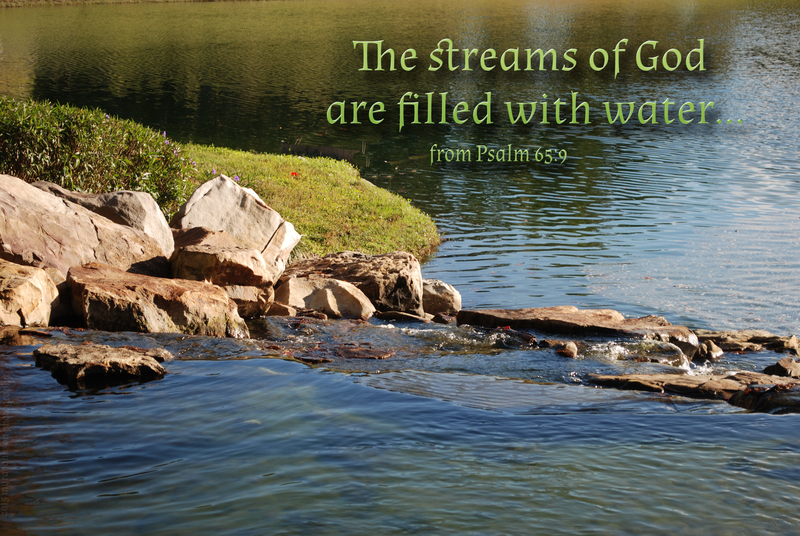 God is in control of that, just as He is in control of the climate. We can get impatient or worried because we don’t see things happening in our lives like we see in others’ lives. If the “trees” are turning beautiful colors of red and gold in the life of someone we know, we may question why everything is still green for us. God knows exactly what we need when we need it. He knows when to introduce opportunities. 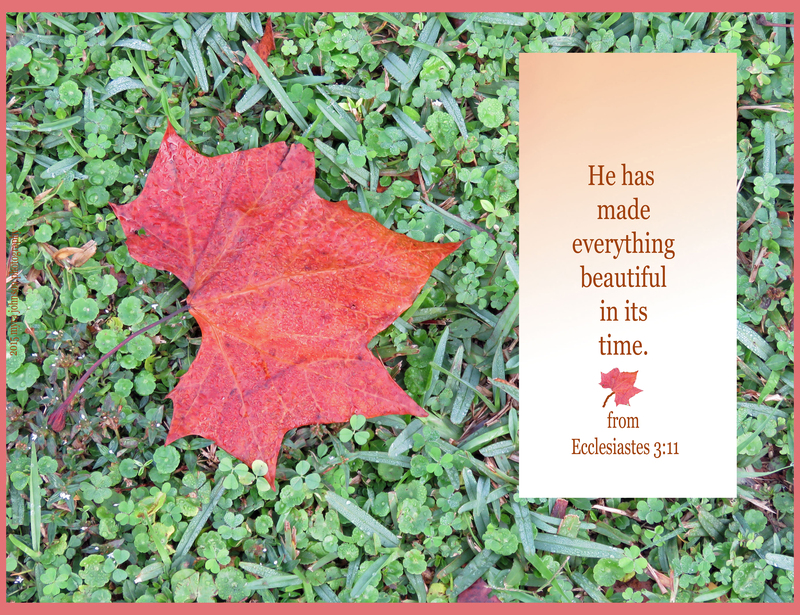 He knows the perfect timetable for every aspect of our journey. Yesterday, I purchased a new Bible. It is The Voice translation. 18 No one who believes in Him has to fear condemnation, yet condemnation is already the reality for everyone who refuses to believe because they reject the name of the only Son of God. 19 Why does God allow for judgment and condemnation? Because the Light, sent from God, pierced through the world’s darkness to expose ill motives, hatred, gossip, greed, violence, and the like. Still some people preferred the darkness over the light because their actions were dark. 20 Some of humankind hated the light. They scampered hurriedly back into the darkness where vices thrive and wickedness flourishes. 21 Those who abandon deceit and embrace what is true, they will enter into the light where it will be clear that all their deeds come from God. If you do not know Jesus as your Savior today, please don’t wait. It’s not too late to choose everlasting life…..
God describes a ruthless people known as the Chaldeans in the Old Testament book of Habakkuk. They were a people who were feared because they would go out in war and conquer other nations. Becoming so powerful, I suppose their ability to achieve and maintain this reputation might have been the thing they were most proud of. 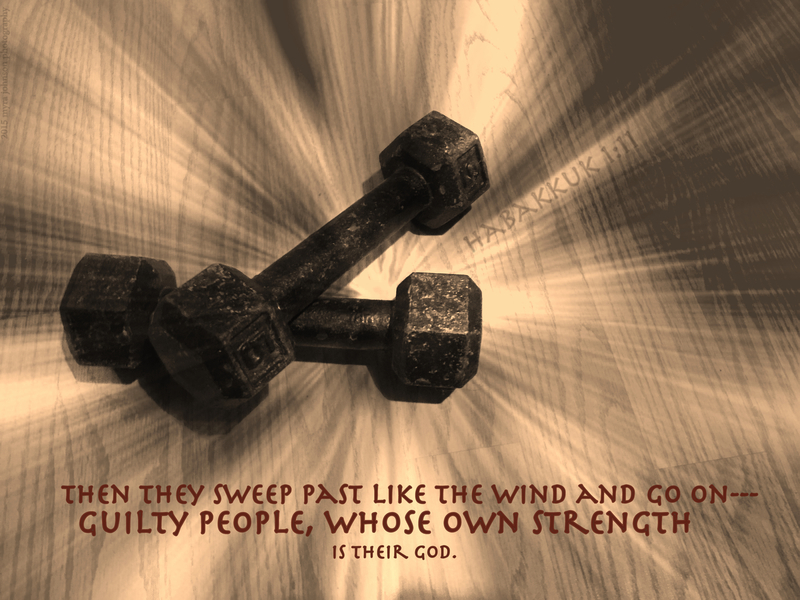 Their own strength being their god? They must have been consumed with their own importance and presumed greatness. I heard someone reading the other day. In pondering those words this afternoon, I thought how this is not correct. Our frail strength should never be something we trust in. Any of our successes are blessings from God. We need to look to God for all our strength. 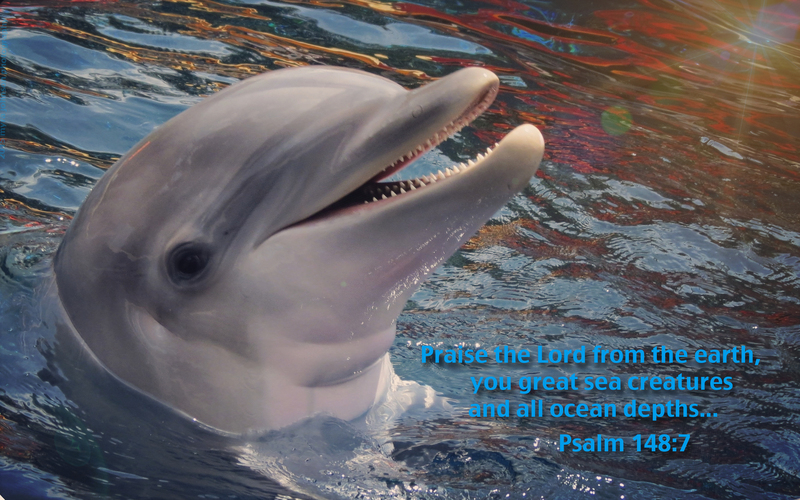 We should praise Him for all our successes—always.